I’ve always loved travelling. When I was little, it was my dream to see the world. And now I am a part of that adult world, it is still my dream, except now I’m also more aware of the difficulties coming with that dream. Such as money and time. Though I consider myself lucky and have been able to travel to some nice locations already, there are still sooo many travel destinations I want to get to. Luckily there are books, which help you travel the world from the comfort of your couch. And sometimes, they even fire up that travelbug inside of you. Come on, Amsterdam is only like a 2 hour trainride away from where I live. I have no excuse not to have already visted Amsterdam. And The Fault in Our Stars made me want to go there even more. I want to visit the Rijksmuseum, The Anne Frank House, I want to walk by the canals and see THE bench. Check out this fun post for the locations from the film. Okay, I actually already visited Paris on a school trip in high school once. But that was 15 years ago (yes, I am that old already). I want to see it again. And Anna and the French Kiss made me put it back on my list for a second visit. Notable bookish locations I want to (re)visit: the Notre Dame, the Louvre, Point Zero (because this is such a cute moment in the books), Shakespeare and Company (because books)and the Eiffel Tower (because duh). Check out this fun post for an Anna and the French Kiss tour of Paris. I read these books years ago and was addicted to the movies but though I don’t remember much, I do remember how much these books and movies made me want to go to Santorini. Greece in general seems beautiful, but Santorini feels especially picturesque. Okay, so this was not an actual location in the books. BUT the movies were filmed there and Hobbiton is an actual place you can visit and I just really, really want to go okay? New Zealand just seems so beautiful, with gorgeous nature and I want to see it for myself. (and yes, I want to pose for a picture in front of a hobbit home and pretend I live there). I could maybe even combine this trip with a trip to Australia, which is also on my bucketlist? Prague just feels like it came straight out of a (albeit slightly dark and gloomy) fairytale, and Daughter of Smoke and Bone made me want to visit it even more. I want to see Charles Bridge, Prague Castle, St. Vitus Cathedral and Old Town, for example. Check out this fun post for a Daughter of Smoke and Bone tour of Prague. Even if The Crown’s Game takes place in a fantasy Tsarist Russia and Moscow, it still made me want to visit Moscow today. Just look at that gorgeous St. Basil’s Cathedral. Truthfully, Wanderlost made me want to backpack through the whole of Europe, just as they do in the books (well, there they don’t so much backpack as do a guided bus tour with older people, but still). But if I have to choose one place it made me put on my bucketlist even more, it’s got to be Venice. I want to see St. Mark’s Square, the Basilica, I want to see the canals and do the cliché ride on a a gondola. 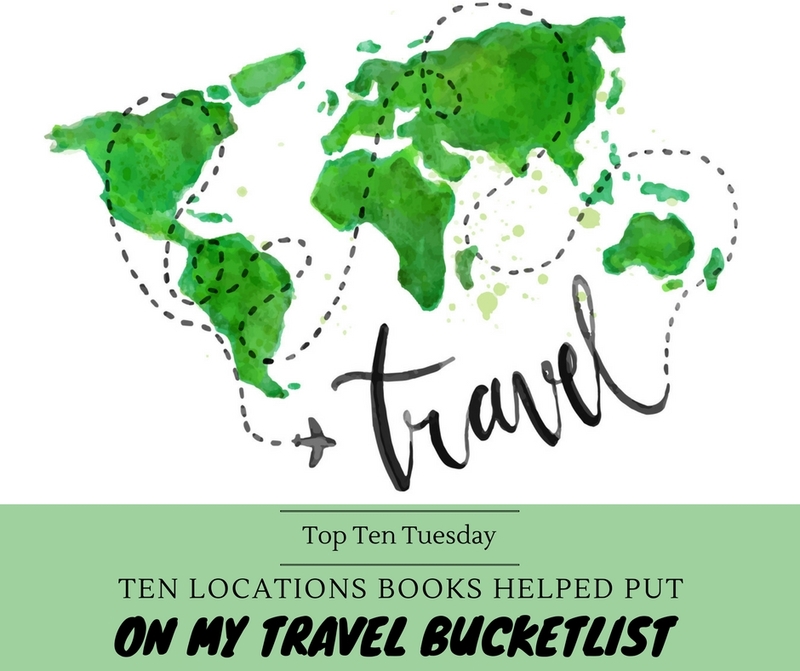 WHAT ARE SOME locations books helped put on YOUR travel bucketlist? I want to visit Paris after Anna and the French kiss . Bee (Quite The Novel Idea / Novel Ink) recently posted…I Love These Books That Take Place In Foreign Countries! I’m crazy for traveling, too. I probably won’t make it to all these places before I head out of this world, so I am choosing to go via books. I’m always on the lookout for books from other places. Thank you for your list! Here’s my list: Books Set in Another Country. I hope you will stop by and take a look. Books are a great way to travel indeed! I need to read that Red Winter books! The covers look amazing. They are amazing books, hope you’ll love them as much as I did if you decide to pick them up! My boss says Santorini is amazing! And I totally want to visit New Zealand someday as well. I have a friend down that way in Auckland. I want to go visit the Hobbiton set in New Zealand soooooooo bad! It’d be an amazing experience indeed! I love Paris, so beautiful-I’m writing a book that’s partially set there atm, so maybe one day I’ll get to go back, you know in the name of “research”. I’ve been to Amsterdam, and Santorini, both lovely, Santorini really only needs a couple of days, it’s a very small island, but Amsterdam probably a bit longer! I go to London quite a lot, but then I live an hour away by train, so it’s not hard to get to! I went to Barcelona when I was a kid, but haven’t been for a long time! The rest of your list, I haven’t been to, but would love to go to all of them! I haven’t been to Amsterdam either but I really want to. One of my biggest dreams is to visit the van Gogh museum. Great list and oh yes, Harry Potter definitely put London on my travel bucket list as well. I really like how you did this post!! I would like to read The Crown’s Game and Red Winter for something totally new. I read Daughter of Smoke and Bone and The Hobbit. Very nice! I hope you’ll be able to visit Paris someday! Fun list, Lindsey – and title!! I love it when books make you want to visit a place. I read Isla not long after I’d been to Barcelona and I remember thinking “why didn’t I go and see that? !” I would love to go back and visit all the places they do – I feel like it makes re-reading so much more fun when you can add your own memories of what a place looked like into the story. Thanks for including my Anna tour of Paris! Yes, exactly! I did see Paris, but after reading Anna I just had the urge to go back right away and visit all those places. 🙂 Thanks so much for your amazing Anna tour!